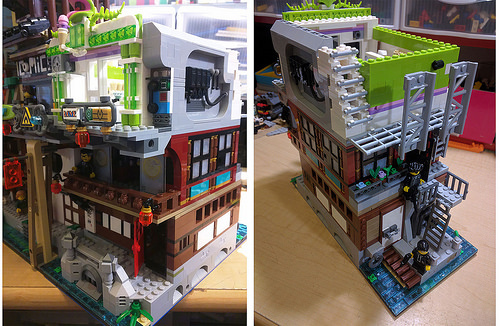 We provided contributors with three templates for city blocks to ensure that any block could fit next to any other: an outside corner with 2 sides facing out, an inside corner with 2 sides facing in, and a straight corner with a front and back. 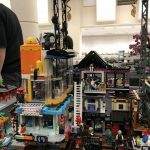 Each template had to be flush or inset, rather than overhang on any connecting side. 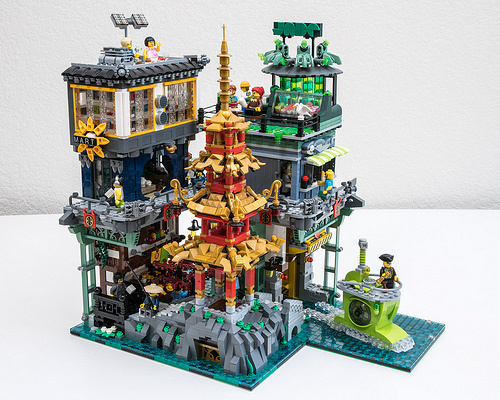 The only other guidance was around the nature of Ninjago City as a vertically growing city, where the lower levels were meant to be older, with more muted colors and traditional construction, and the upper levels featuring more modern and futuristic designs. 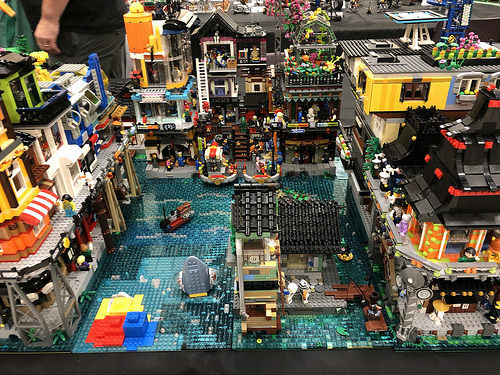 These broad design constraints turned out to be the perfect blend of standards and creative freedom, as the resulting city was truly amazing! 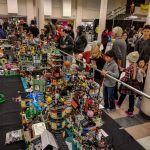 And far more than the sum of individual parts. 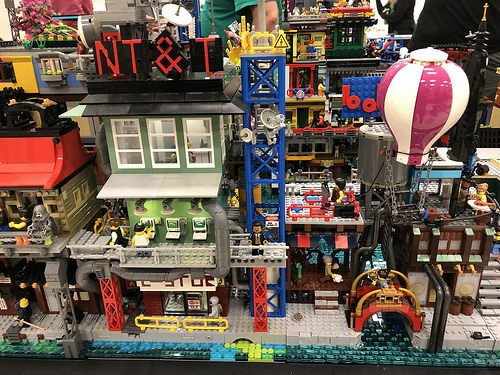 Contributors were able to express their creativity in so many different ways, taking inspiration from the official sets, from each other, as work in progress photos were shared on Flickr, and from their own imagination. 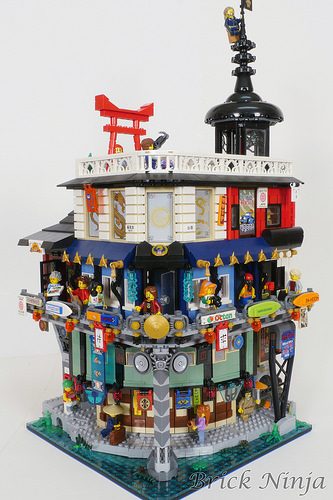 The fact that Ninjago City has so many traditional and modern architectural themes, combined with the endless variations of parts and colors available from LEGO enabled builders to explore so many color combinations. 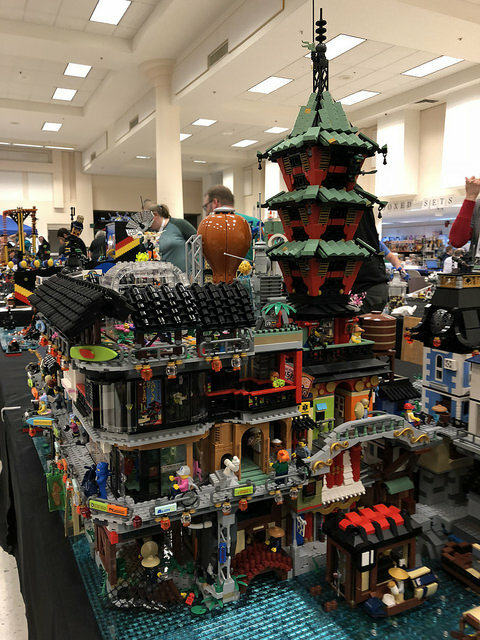 I was blown away by what the contributors brought to the display. 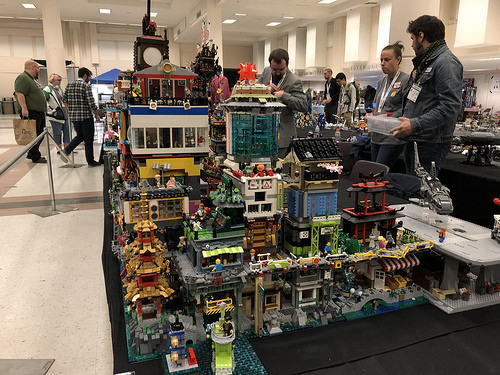 The display spanned four tables wide and 2 deep in a flowing skyline with one main row, as well as sections of a back row, and plenty of harbors, canals, and gardens. 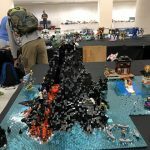 We even had a huge volcanic lair for Lord Garmaddon. 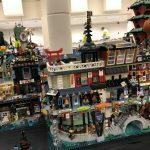 And although photographs in a convention-setting can’t possibly do justice to the fantastic details on display, let’s a take a quick tour of everything our amazing readers created. 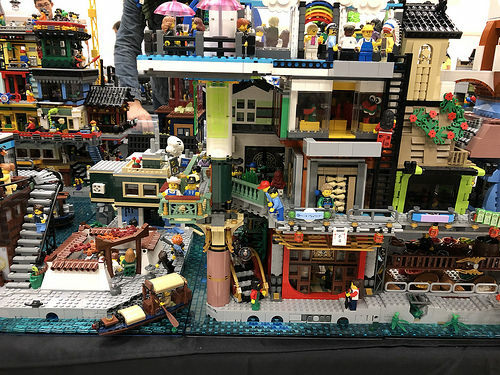 We start our tour of Ninjago City at the right end of the table, where the public flow started. 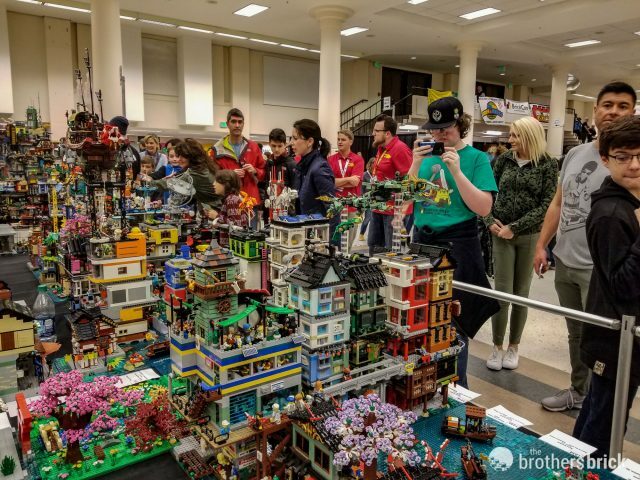 Everyone who participated got to take home a custom-engraved brick badge, but we picked out a few especially impressive creations to award special recognition in the form of a trophy and some sweet loot. 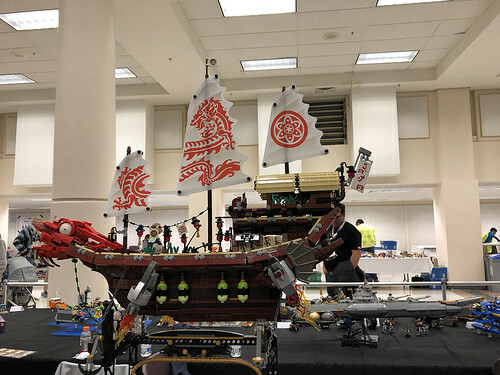 The Laser Pointer Accuracy Award: Our winner for best movie accuracy was the Destiny’s Bounty by Micheal, who updated the official set to match the on-screen version, which had only one dragon head. 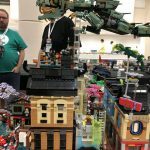 He also completely re-built the hull of the ship and balanced it precariously three-feet off the table atop one of his modules. 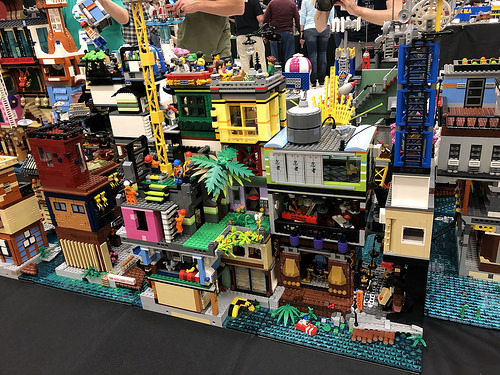 The Ultimate Ultimate Block Award: Our winner for the best block was Kevin with a literal rounded corner block that featured lots of impressive interior details. 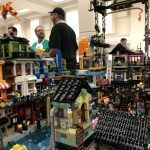 We also recognized a selection of participants who stood out to us for smaller details, each receiving an engraved brick. 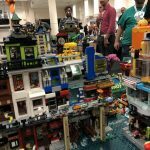 Best Upper Level went to for his rooftop aquarium with 2 sharks circling each other. 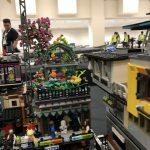 Best Lower Level went to neroorennero for his lighted cafe. 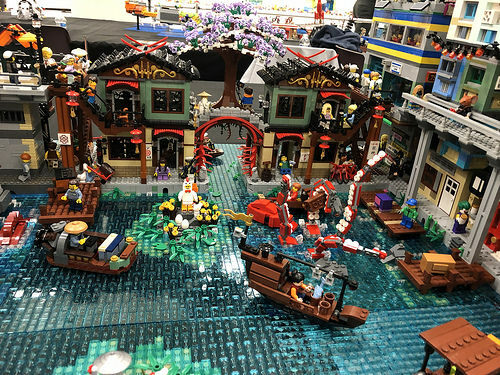 Most Ninja Fig went to Chef Garmadon, featured in the second-floor restaurant in the block by Brett. 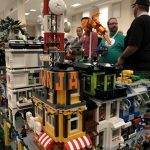 And our trophy brick for Most Awesomest Building went to the amazing rolling Ninjago City by Mark, which formed the perfect model to lead folks into our display. 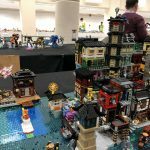 On the last day of the convention, I received an unforgettable gift. 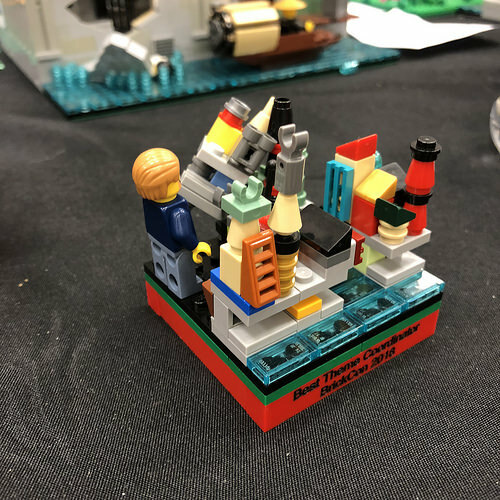 Some of the contributors made me a special trophy and even paid for an engraved brick that matched the other trophy bricks given out during the award ceremony. 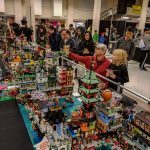 I want to personally thank each and every contributor for making this such an amazing collaboration. 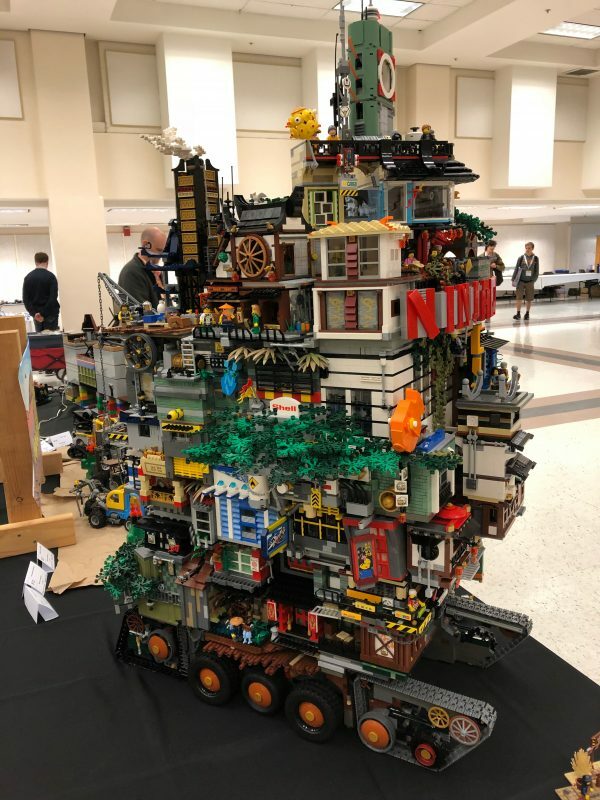 The endless creativity and inspiration when LEGO builders come together is one of the many joys of being a part of the AFOL community. 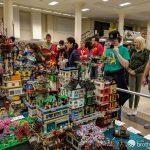 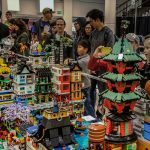 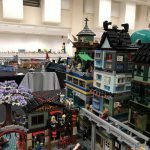 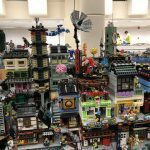 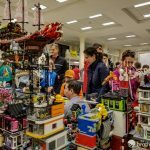 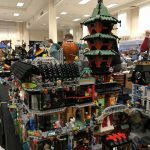 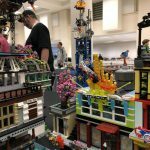 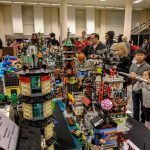 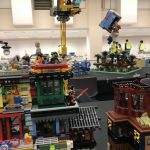 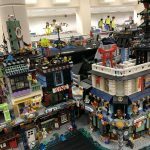 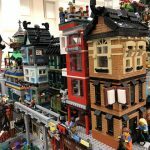 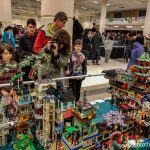 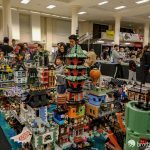 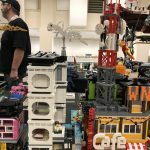 I hope to see you all next year at BrickCon 2019! 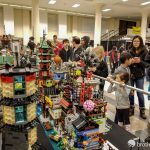 You can come see the shark tank on display right now in Portland Oregon, at the Central Library. 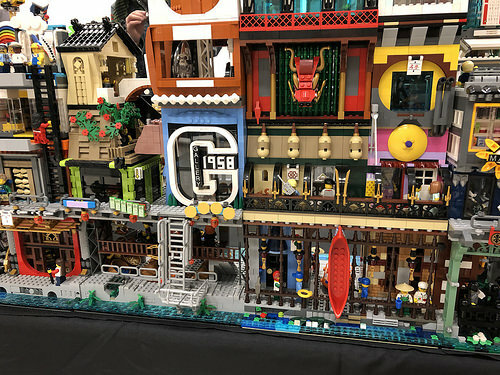 We’re exhibiting 22 local builders, through Jan 6th :) Such a cool collab!